I figured that the space and power stones would allow Thanos to either break or escape the spell. I havent read any comics, but I would think a dude like Thanos would see the start of that spark ring and counter. Personal take. @frosslem, I can totally see something like that, that it doesn't work on him; but that they didn't at least try or ask is weird. It's such a translatable thought, the hands are even a similar color and proportion. @Paige pages pa page, I suppose it does invite the question. You as the viewer are left to reason it for them, or critique the writing quality. I find filling the gaps fun, but I understand others prefer to have a character's thoughts laid out. 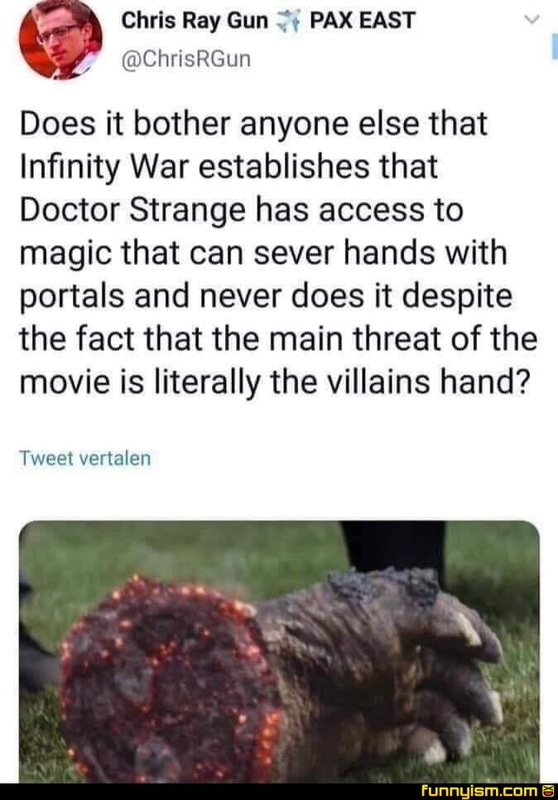 @frosslem, I think it's because doctor strange cant move the portal, you always see it stationary while something moves through it. Meaning thanks would have to willing place his hand in the portal like obsidian did in NYC. Second he cant kake a portal in a solid object i.e around Thanos hand and then close it. So while it looks like a plot hole it does make sense why they cant just chop his hand off with the sling rings. @frosslem, I generally go for the “Inertial Dampeners”* approach. It’s a work of fiction bringing together a host of super-powered individuals, there are always going to bits that would struggle for a good explanation so I just roll with what’s in the film. *I call it that after hearing about a time when Trekkies at a convention asked the guys behind Star Trek how the inertial dampeners work, their answer was “very well”. @frosslem, they could have easily done it when they had him suppressed and were trying to remove the gauntlet. Just have strange open the portal on earth and take the arm off. @PG12, In Thor Ragnarok, Doctor Strange moves the portal to forcefully transport Loki and Thor to Odin. The movies were directed by different people, so inconsistencies are inevitable. Well he did say that that was the only way. Which, now that I think about it excuses any possible writing shortcomings. Or just use it to decapitate him? The second I saw the hand scene, the movie became less of an enjoyable experience. They at least could have had him try and then fail because "he's too strong", or something. I thought the portals only worked on earth. They aren't on earth therefore no portals.